I was invited to reflect on speaking and telling stories with groups of people, the gift, the connection, the sharing of life and meaning: click here to listen to the conversation. Thanks to Tricia Karp for the invitation, and for the thought-provoking questions. It's not about where they're being sent - though it would seem there are significant concerns on that front (such as in this smh article). It is that we are sending them away at all. It is that there is 'we' / 'us' and 'them'. I am dismayed at the lack of courage in the leaders of this country to lead us - all they are doing with this 'stop the boats' rhetoric is following a portion of the community who are giving in to fear. This is when we need our leaders the most - to remind us of who we are, as humans, as a nation. I've been in Brisbane this week, at the Network of Biblical Storytellers Australia National Gathering, then spending time with family. While at the gathering, I led our Eucharist (Holy Communion) celebration. 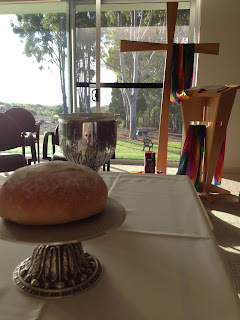 I used prayers from proost pocket liturgies by Cheryl Lawrie and Mark Berry, and wrote the liturgy for the Eucharist. Here it is, and others are welcome to use it. One of the items on The Project last night has got me thinking. They were addressing the issue of the availability of contraceptive and abortive medication and procedures. There are some in our community who are disappointed that a particular drug has been added to the PBS, making it cheaper and more accessible. I have no problems with doctors, nurses, pharmacists and other medical practitioners having the freedom to choose not to prescribe medication or perform procedures that contravene their conscience or religious beliefs. It's great, in fact: let's have more respect for people's spirituality as part of their whole person, perhaps even a generous spirit towards a Muslim swearing an oath on a religiously appropriate Sacred Text?? But as medical practitioners explained their commitment to not only not providing these medications themselves, but also not helping a person find someone who would, I began to feel uneasy.